I recently had Vegan Cuts contact me and ask me if I would like to receive one of their monthly Vegan Cuts Snack Boxes to enjoy and review. Naturally, I said yes. What’s not to like? It’s vegan and it’s free! Score! Vegan Cuts is a very cool and conscious marketplace where consumers can discover and buy great vegan products, from food to clothing to beauty supplies. It is conscious consumerism at it’s best. They also offer a monthly subscription service for $19.95 where you get to try 7-10 of the latest vegan products in their Vegan Cuts Snack Box. I fortunately do not have much of a sweet tooth, but my little girl Grace does. She loved these! And I feel good about letting her have them since they are organic and have no HFCS. Hey, it’s Halloween, let the kids have a few treats, just make them as healthy as possible. Available at Walgreens, who knew? You had me at lentil chips! Great for dipping, especially with hummus. Again, I don’t have much of a sweet tooth, but Grace was happy to gobble them up. More, delicious gluten-free chips, hells yeah! Ditch the soda, give this a shot! Description wasn’t listed, but still is very deserving of praise. It’s raw, vegan and delicious, I’ll take it! As a vegan, I am constantly sifting through the choices presented to me each day to find those that meet my standards. So I must say it was quite refreshing to receive a whole box full of treats that had already passed my litmus test. I am grateful to have been given all these treats and I would recommend Vegan Cuts for anyone looking to make more conscious, purchasing decisions. 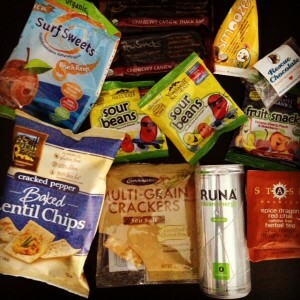 The Vegan Cuts Snack Box is a great way to learn and try new products that are ethically made with integrity. We are evolving! Thank you Vegan Cuts. You can check them out here.